On Tuesday December 1st, Walt Disney Studios Home Entertainment will release MICKEY MOUSE CLUBHOUSE: MICKEY’S CHOO CHOO EXPRESS and HANDY MANNY: MOTORCYCLE ADVENTURE on DVD! Join Mickey and the Clubhouse Gang as they hop aboard the Clubhouse Choo Choo Train for a holiday-filled adventure with lively original music including a new song by the kid-friendly alt-rock band, They Might Be Giants. The journey doesn’t end there, ride along with Handy Manny in a road trip adventure, as Manny decides to bring his friends and tools along for the rideto a fiesta grande – Manny’s family reunion! 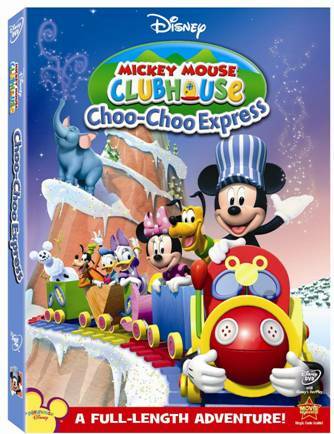 This Yuletide season, Mickey and the Clubhouse Gang hop aboard the Clubhouse Choo Choo Train for a holiday-filled adventure when Mickey Mouse Clubhouse: Mickey’s Choo Choo Express comes to Disney DVD on December 1, 2009. This animated feature includes lively original music including a new song by the kid-friendly alt-rock band, They Might Be Giants; delightful bonus episode, Mickey’s Big Job and an interactive experience with three enjoyable ways to watch the movie. Mickey Mouse Clubhouse: Choo Choo Express stars the Fab Five: Mickey Mouse, Minnie Mouse, Donald Duck, Daisy Duck and Goofy. While Professor Von Drake goes to the top of Mistletoe Mountain to create snow that never melts, the gang put together his old Clubhouse Choo Choo train. They use the train to help the professor carry back loads of his special non-melting snow so that they can build snowmen and make snow angels in the middle of summer. Mickey invites more friends to the Easy Freezy Snow Party so they can all join in on the fun. In order to get everyone out to the clubhouse, they adhere to a train schedule where different folks, including Santa and Ms. Claus, are picked up along the way at designated times. When Mickey and friends all make it back just in time for the party, Professor Von Drake presents them a gift – a golden car train – in appreciation for picking up everyone on the Clubhouse Choo Choo train. Mickey’s Big Job Willie the Giant is off to visit his Mama. Before he leaves he asks Mickey and his pals to house-sit his farm. The gang is eager to help, but Willie's "little list" of chores turns out to be a big hassle considering how small they are in the giant's home. With a big "can do" spirit, the Clubhouse gang set about the chores and all the jobs get done in time earning a mammoth thank you from Willie when he gets home. 2. Adventure mode 1 (ages 2-3) – as you watch the movie, use your remote to answer fun questions about colors, shapes and sizes. 3. Adventure mode 2 (ages 4-5) – move to a higher level with more challenging questions using your remote. 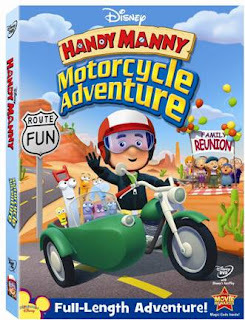 This holiday season, the first ever Handy Manny full length story, Handy Manny: Manny’s Motorcycle Adventure is coming to Disney DVD. Available on December 1, this animated cross-country expedition features a thrilling bonus episode, A Very Handy Holiday and new music including an original new song by legendary Latin-rock band Los Lobos. In this road trip adventure, Manny decides to bring his friends and tools along for the ride to a fiesta grande – Manny’s family reunion. With everyone safely aboard his magnificent motorcycle, Manny helps the communities he passes through with fixes and repairs, and even has time to teach Pat the hammer that families come in all shapes and sizes. With quick teamwork and clever steering, Manny manages to rescue Pat, Squeeze, and Flicker who strayed from the group and get everyone to the reunion on time to partake in the exciting family festivities. A Very Handy Holiday It's the night of Kelly's Winter Holiday Party and Manny and the tools are finishing up their holiday gift making before they go. But when a series of emergency holiday repairs are needed all over town, their celebration plans are threatened and the tools learn that helping others is an even better way to celebrate the holidays. The MICKEY MOUSE CLUBHOUSE: MICKEY’S CHOO CHOO EXPRESS was great! There is lots of excitement in this movie! Ride the Clubhouse Train to the top of the mountain, and help load the train cars full of incredible, never-melting, "Easy-Freezy" snow! I also love the music in this movie! 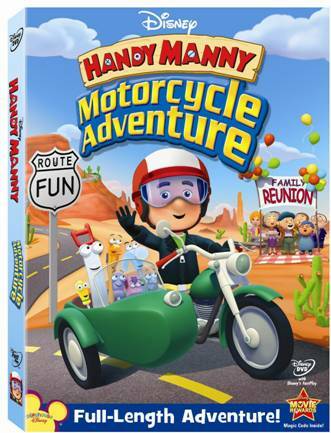 In MANNY’S MOTORCYCLE ADVENTURE come along to join Manny as he packs up his tools for an exciting road trip! The music is great in this one as well! It also has an inspiring message that when it comes to family there is always something to celebrate! Both these movies were fun and made me feel like a little kid again when I watched them! of each of these cute movies! Giveaway ends on Tues. Dec. 1st, 2009. Happy Thanksgiving! I hope you have a day full of fun, family, and yummy food. love these!! my kids thought these were so fun!! They look like such fun. We don't have any videos of either, but know them both. M loves MMC!! Those look like they would be great! Handy Manny is so cute. These look like they would bring joy to some little ones! Yep, I am still happily following you with each post! Mickey and Handy are my two year old's favorite characters. I would love to win the Mickey Mouse Clubhouse movie for my nephew. My baby boy LOVES these two shows so much!!! He would love to win these!!!! Thanks! Both movies look so cute! I know several children who would love watching them! oh my goodness my kids would love love love this. My son especially has been mickey obsessed lately. Dakeri Baca, I love these shows and the movies would be awesome. These would be so popular with my boys. Thanks for posting. These look to cute! Thanks! My boys watched both of these movies when they were on the disney channel and loved them!! My granddaughter loves music so the Mickey Mouse one would be wonderful. Follower:) Thanks for the chance!! My kiddos would love these:) Thanks for the chance!! Great Christmas present for the young children on your list! These would be great for my youngest grandsons! My cute little grandbabies would love these movies. Thanks for doing this. We'd love "Handy Manny..." too. This looks like a fun DVD! Thanks for the chance to win! These two movies are so cute. I would love to win either one of them. My kids would love these both! yeee haw!i hope i entered in time~!